This book succeeds in bringing to life detailed historical research with anecdotes and asides. The book is wide in its range and depth, giving a primer in Scottish history and a geology lesson, as well as the more 'normal' fare of a local history. Stone circles and Pictish settlements are documented; so too is a tale of a motorcyclist who carried our a 'daring ascent' of the Black Spout ravine in 1933 and the recycling of a Roman wine bottle to create a glass toggle for a local family in the 1st Century AD. 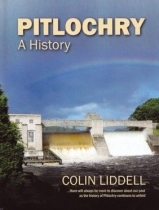 The fate of the MacGregors and the Battle of Killiecrankie are recounted, as are many interesting tales about Pitlochry between its creation in 1728 and now.As well as Pitlochry itself, the history is set against the backdrop of the whole are from Tummel Bridge to Logierait and from Struan through Moulin to Enochdhu, and the histories of villages within this area are also covered.